In order to truly understand the pallet of the old masters an artist must work with the same pigments that were available to the artists of the time. This is a reconstruction of a pallet that Rubens might have worked with, in order to achieve his rich flesh tones. This kit contains the following colors: Genuine Indian Red (Hematite), Turkish Red Deep, Raw Sienna, Burnt Sienna, Ultramarine Blue, Raw Umber very dark neutral shade, Bone Black and Zinc White. Please note that all jars contain 50g of dry pigment and are filled by weight. 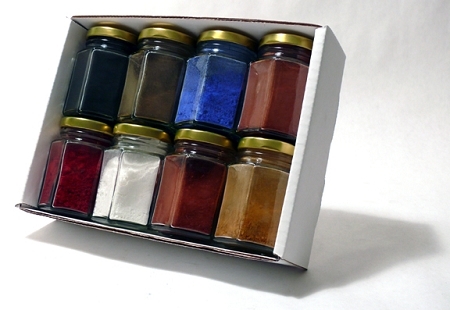 A: All of the pigments are available individually in our pigments section. The starting size is 75g, which is larger than the 50g jars that are contained in this set. Therefore, the total cost would be more, but you would receive more pigments. Simply search for the pigments that are listed below.